The last day of September means it time to reveal my Foodie PenPal for the month. I had Molly. She sent quite the assortment of goodies, including the recipe below for the cake box mix. It is from Paula Deen and let's just say I am excited to try it out. I am also pretty excited to check out the Quaker Real Medleys Oatmeal. I am going to have some early mornings coming up and I think this will come in handy. Thanks Molly for my box of goodies! In a large bowl with an electric mixer, cream the cream cheese and butter until smooth. Beat in the egg. Then beat in the vanilla extract. Beat in the cake mix. Cover and refrigerate for 2 hours to firm up so that you can roll the batter into balls. Roll the chilled batter into tablespoon sized balls and then roll them in confectioner's sugar. Place on an ungreased cookie sheet, 2 inches apart. Bake 12 minutes. The cookies will remain soft and "gooey." Cool completely and sprinkle with more confectioners' sugar, if desired. -Foodie Penplas is open to US and Canadian residents. Please note, Canadian Residents will be paired with other Canadians only. If you’re interested in participating for October, please CLICK HERE to fill out the participation form and read the terms and conditions. You must submit your information by October 4th as pairings will be emailed on October 5th! We are on vacation in Iowa for a long weekend. I have been busy introducing Mr. J to where I grew up, Midwest style all of the way. When I lived here of course there were way more corn fields. Things have changed so, so much. I could even go so far as to say there are cool areas. Yes, Iowa has definitely became cool. Every year Mr. J wants apple pie. Every year I dread making it. I don't mind the actual making of the pie, I just don't really like pie. Dessert needs chocolate. We are talking cookies, cake, and ice cream. Those are my kind of desserts. Mr. J likes all sorts of fruit desserts. Pies, tarts. We can NEVER share dessert at a restaurant because this is just one thing neither one of us will compromise on. This year I wanted to make something with apples but I refused to make a pie, at least this early in the season. 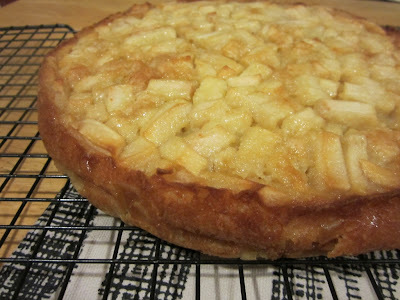 I saw this French Apple Cake recipe and thought I would give it a go. Let's just say I trust the French. The little bit of rum didn't hurt either. We had this on Saturday night hot from the oven. It was 3/4 of the way gone by Sunday night. Preheat the oven to 350ºF and adjust the oven rack to the center of the oven. Peel and core the apples, then dice them into 1-inch pieces. Stir in the remaining flour mixture, then the rest of the butter. Fold in the apple cubes until they’re well-coated with the batter and scrape them into the prepared cake pan and smooth the top a little with a spatula. Bake the cake for 50 minute to 1 hour, or until a knife inserted into the center comes out clean. Let the cake cool for 5 minutes, then run a knife around the edge to loosen the cake from the pan and carefully remove the sides of the cake pan, making sure no apples are stuck to it. Serving: Serve wedges of the cake just by itself, or with crème fraîche or vanilla ice cream. Storage: The cake will keep for up to three days covered. Since the top is very moist, it’s best to store it under a cake dome or overturned bowl. When Mr. J got me a doughnut pan for my birthday I was super excited. Now I think he had his on motivation behind the gift. Not long after my birthday he started asking when I was going to use it. Being so busy with work there wasn't too much time to really sit and actually make the doughnuts till the other day. Since the other day was officially Fall. Apple cider was in the air. Apple Cider doughnuts seemed like the perfect fit. Clearly I was a little excited when filling the pan. When filling the pan be sure to under fill each area. I am talking about maybe, maybe 1/2 full. They rise quite a bit. I filled the first batch flat to the top and the doughnut centers disappeared. Topped with cinnamon and sugar. Oh man were these absolutely delicious. I am pretty happy with my birthday gift, but I am pretty sure Mr. J is too. In a large bowl, combine flours, baking powder, nutmeg, cinnamon and salt. In a measuring cup or smaller bowl, mix together apple cider, sugars, molasses, applesauce, melted coconut oil and vanilla extract. Add cider mixture to flour mixture and stir until just combined. Spoon batter into a greased doughnut pan (or muffin tin). Bake for 11-13 minutes, until donuts are slightly browned and firm. Dust with cinnamon and sugar while still warm, if desired. 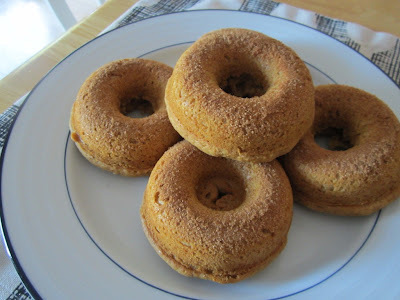 Note: since these doughnuts are not fried, there will not be grease for the cinnamon and sugar to adhere to. If you really want the cinnamon/sugar to stick heavily, consider brushing the donuts with a big more melted margarine or coconut oil. But the doughnuts have enough flavor and sweetness with just a light dusting. I am completely in love with fall. I think this year since it was so hot for so long, the cooler temperatures have made me bounce right into full blow fall mode. I alright want to buy pumpkins and it isn't even October. I am trying to hold back a bit longer on the pumpkin buying and instead relying on my kitchen time to incorporate Fall. This is no Starbucks latte but it is a great day to start the day. If you need it a bit more sweet add some honey, maple syrup, or agave. Add all ingredients in blender. Run till smooth, about 3 minutes. This smoothie is not particularly sweet. If you would like something sweet, add 1 Tbsp honey or maple syrup. Lunch was leftovers from the Shrimp and Rice Casserole dish packed up and eaten in front of my computer. I love when I can pack up dinner from the night before and have a nice warm lunch with little effort. I don't love when I have so much work it requires me to go non-stop from 7:30-5:30. My healthy habit of being outside didn't come into play today. Snacks were carrot sticks, peach, and apple throughout the day. Now if you thought lunch was healthy just wait for dinner. We go pizza takeout. Sausage, onions, peppers, and garlic. Sometimes life calls for a little pizza. 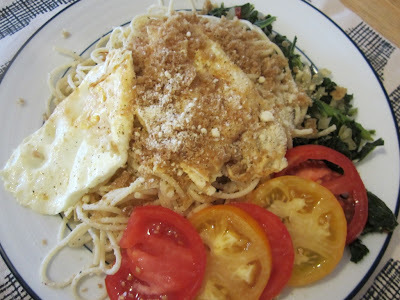 When I received a sample of Texmati® Brown Rice and was asked to make a cultural dish all sorts of ideas came to mind. I am a huge fan of ethnic cuisines and the hotter, spicier dishes the better. Initially I had some ideas of spicy Thai dishes. I then thought of all of the wonderful Mexican dish I could make. Burritos anyone? But with a little internet searching I soon came up with this Cajun dish. 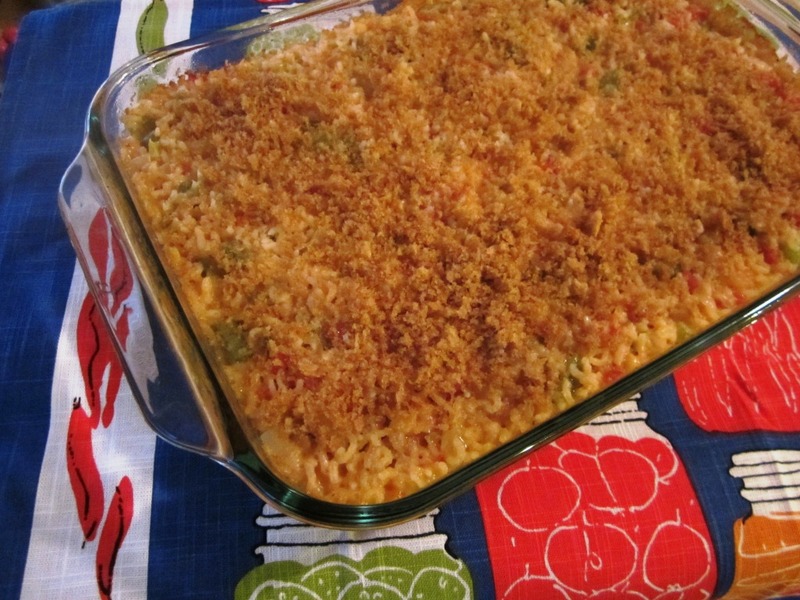 Shrimp and rice casserole by Jenna. Cajun is definitely its own culture. A culture I hope to explore one day in person. Until then I will just have to live through this casserole. 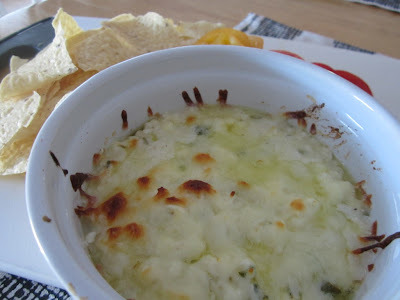 This recipe is super easy and super flavorful. 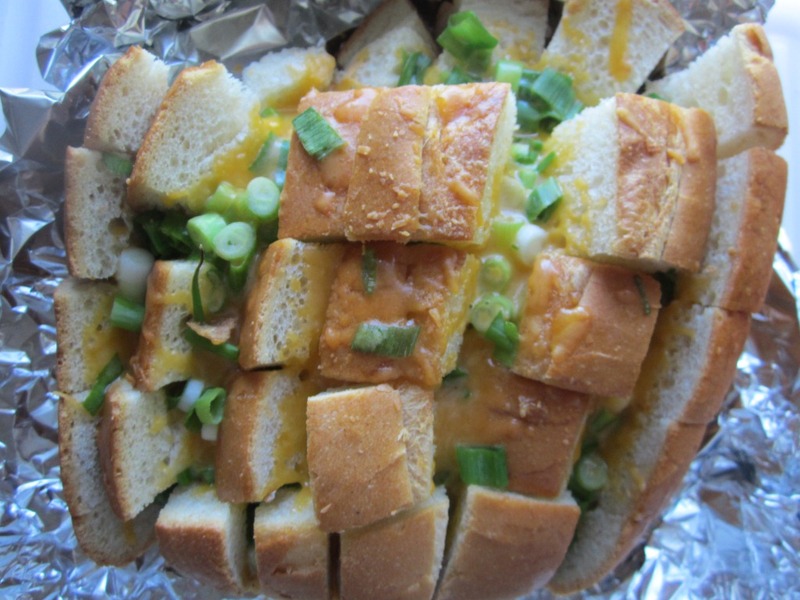 Throw all of the ingredients into a bowl, mix together, and then pour into a buttered baking dish. The brown rice puffs up absorbing all of the liquid ingredients. The original recipe calls for white rice but the Texmati® Brown Rice holds the flavor without adding any distinct brown rice taste. My husband, always the picky eater, didn't even know it was brown rice. Now we just need some beignets. 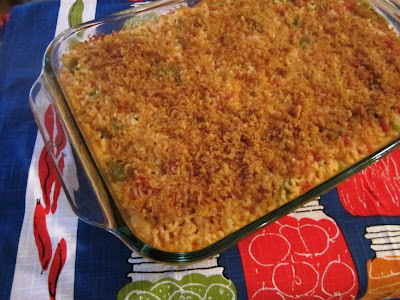 Place the butter in a 12 x 9″ casserole dish and place dish in the oven so the butter melts. After the butter has melted at the bottom of the dish, remove from oven but keep oven on. In a large bowl, combine the shrimp, raw rice (do not cook first), cream of celery soup, cream of chicken soup, tomatoes, diced yellow onion, diced green pepper, salt and pepper. Stir well to combine. Pour mixture over the melted butter. Cover dish tightly with foil and bake for 30 minutes. After 30 minutes, stir well. Re-cover dish and cook for an additional 20 minutes. Remove and add bread crumbs. Re-cover and cook for a final 10 minutes, the rice should be fluffy and have absorbed all liquid. As part of the DailyBuzz Food Tastemaker Program, I received a free sample of RiceSelect Texmati Brown Rice although the opinions expressed in this blog post are my own. This post is brought to you by Rice Select. I cannot believe another month has passed. September has come and gone way too fast. The end of the month means that it is time to post September's Secret Recipe Club reveal. For September I had The Spiffy Cookie. Now you know my love of cookies so I was all excited when I got Erin. I have actually been reading The Spiffy Cookie for a while. I knew I was in for a treat. She whips up some mean recipes. She is also a smarty pants who is currently working to earn her PhD in Biomedical Sciences. Biomedical Sciences just scares me; I never enjoyed science. I had a pretty hard time picking which recipe to make. I could have made these doughnuts or these cookies. The fact of the matter is when I was looking to pick a recipe. I was home by myself and in the mood for cheese. The Baked Crazy Feta recipe jumped out at me. I pretty much ran to the store to pick up the feta. Came home and made this for lunch. I eat weird things for meals when left to my own devises. Of course, I threw on some tomatoes for a bit of healthiness. The only thing I changed was to add two extra jalapenos. I made this in the toaster oven. Twenty minutes later I was in feta heaven. Mr. J had the leftovers reheated and he loved it as well. This would a great recipe to share if you can wait long enough till a sharing occasion presents itself. Preheat oven to 400 degrees. Lightly grease a 16 oz casserole dish and set aside. In a large bowl, crumble the feta. Add diced jalapeno, the lemon zest and juice and garlic. Add olive oil and mash with a fork. Taste the feta and season with salt and pepper. Transfer to prepared baking dish. Top with Mozzarella and bake for 15-20 minutes or until cheese is bubbly. Serve with pita or tortilla chips. Store leftovers in the fridge for up to a week. Saturday Mr. J and I were restless. And as much as I am a planner sometimes a little spontaneity does a girl some good. We decided to jump in the car and go to Brooklyn. Brooklyn is about two hours away. A bit far for lunch but we were ready for an adventure. Sadly, we ran into a few hiccups. We forgot the EZ pass. Thank goodness we had cash but where we were going needed cash at our destination. Williamsburg needs some banks. We have accounts at two national banks with no luck. There were some serious restrictions on cash back but thankfully Dwayne Reed has nifty Chase ATMs. You cannot tell from this photo but the people of Brooklyn are super hip. Mr. J described it as another world where the culture is hipster. There were tons of trendy dogs too. We also hit traffic. The volume of cars on 95 and pretty much everywhere around the city is incredible. I used to have anxiety attacks when I had to drive myself down to the airports. Mr. J drove yesterday. I know I married him for a reason. Finally parking was a royal pain. More cars. A bit of construction. Clearly there are some expert parallel parkers out there. We chose a garage. Paid a ton but at least they took credit cards. After much debate Mr. J opted for a turkey leg. Why did we go to all this trouble? Well, the Brooklyn Smorgasburg of course. This flea market with food vendors. Lots of them. There is probably 50 some vendors lined up just like the ultimate farmer's market but we mainly premade foods. There was BBQ, Bolivian, Ethiopian, Colombian, Seafood, Mexican, Pastries, Ice Cream, and even Jerk and Pickles. We must have walked around the entire place three times before deciding what we were going to eat. I had Fried Chicken and Cheddar Waffles. The Cheddar waffles part is what sold me. Homemade S'mores anyone? I got the Salted Sailor. Cinnamon graham cracker with vanilla bean marshmallow and caramel sauce. We shared a drip coffee from the Blue Bottle Co.
And a doughnut from Dough. 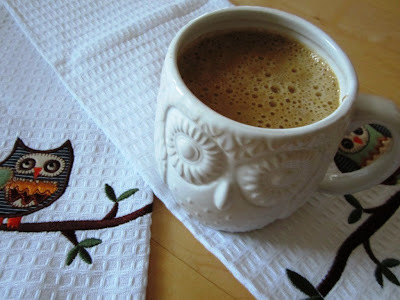 Cafe au lait. It was marvelous. I had two bites. Best two bites of my life. We had so much fun! I hope you had a great weekend too. Weekend Edition: Cake and Birthdays!